Student loans are the single largest source of non-housing debt in the US. Americans hold a staggering $1.5 trillion in student loan debt, and that number is only going up. Our culture continues to push the notion that a college degree is some sort of guarantee of a good job and financial stability, even as skyrocketing tuition, stagnant wages, and a challenging job market mean that millions of students graduate with tens, or even hundreds of thousands of dollars in debt. From the moment they leave school, these borrowers are funneled into a system designed to extract payments for decades. The cost of college rose 8x faster than wages between 1989 and 2016. In 2014 only 65% of recent college graduates were employed. 51% of the employed graduates were in jobs that did not require a college degree. In 2015 60% of the 38 million Americans with student debt (22 million in total) were not making payments. Every quarter 250,000 borrowers default on federal student loans. Click here for more statistics on American student loan debt. The average cost of a four-year degree was up to $104,480 in 2016, double the cost from 1989 after adjusting for inflation. Meanwhile, real median wages only increased from $54,042 to $59,039 in that same period. 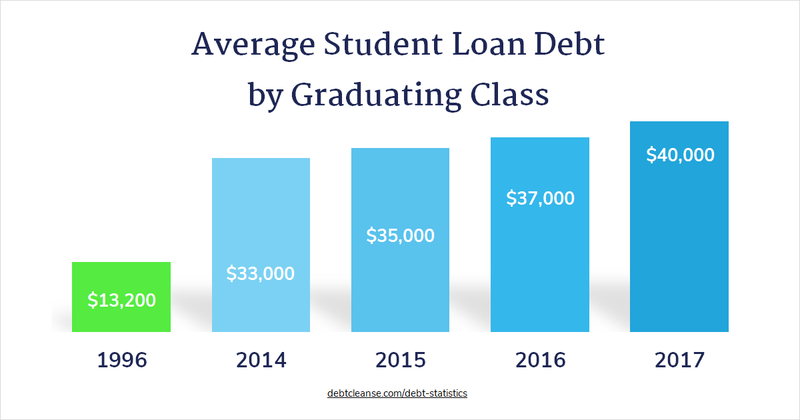 So it’s no surprise that people are having to borrow more often, borrow larger amounts, and that seven out of ten students graduate with debt. And the impact of that debt can be farther reaching than you might realize. When most people hear the phrase “student loans,” they picture someone in their 20s, fresh out of school. But in fact, the number of borrowers between the age of 45-74 with education-related debt have sharply increased over the last two decades, and those borrowers tend to owe larger amounts than borrowers under age 35. Some of these borrowers are still paying for their own education, or decided to go back to school later in life. The majority, however, are parents—and increasingly grandparents—who are helping their child or grandchild through school. An analysis by NerdWallet found that the number of borrowers with Parent PLUS loans nearly quadrupled between 1989 and 2012. Millennials, Gen Xers, and Baby Boomers alike are finding that their student loans are standing in the way of them enjoying some of life’s biggest moments. 36% of Millennials, 26% of Gen Xers, and 32% of Boomers have put off buying a house. 30% of Millennials, 25% of Gen Xers, and 30% of Boomers have put off buying a car. 25% of Millennials, 21% of Gen Xers, and 18% of Boomers have been unable to move out of their current living situation. 41% of Millennials, 38% of Gen Xers, and 31% of Boomers have been unable to save for retirement. That last statistic may be the most dangerous in the long run. Millennials are entering the workforce at a time when employers are contributing less and less toward their employees’ retirements. “With Gen Y being in defined contribution plans, the time for them to really get ahead is in their 20s and early 30s, but if they have a huge student loan, they really can’t do that, ” said Michael Ericson, research analyst for LIMRA’s Secure Retirement Institute. Student loan debt can also affect your daily life in ways that are discussed all too rarely. The stress can take a measurable toll on your psychological and physical health. Over 61% said they felt their worries about their debt were spiraling out of control. 5% said worry about their student loan debt was causing insomnia. Over half associated their debt with feelings of dread, irritability, and depression. More than two thirds said their anxiety about their debt was causing physical symptoms including headaches, muscle tension, and stomachaches. Additionally, nearly 75% of respondents in the Student Loan Hero survey said they had shut other people out of their lives because of the stress of their student loan debt. This paints a picture of student debt sufferers as withdrawn and isolated, stressed to the point of physical pain, but too paralyzed by anxiety and shame to do anything to break the cycle. DebtCleanse founder and CEO Jorge Newbery knows what it feels like to have the stress of debt overtake your life, and wrote the book on getting out of unaffordable debt to help others do the same. Click here to download a free chapter on student loans. You’ll learn tips and tactics that you can use to fight back against the system of endless payments and sleepless nights. If you’re one of the millions of Americans paying more from each paycheck toward your student loan than toward groceries, your debt may feel insurmountable. The good news is, there are steps you can take if you’re facing debt you can’t afford. Looking for more assistance? A free DebtCleanse account unlocks access to the DebtTracker to stay organized in your debt-free journey. Premium members also have access to a Letter Generator to push back against creditors, Action Tools including a list of over 130 mistakes creditors often make, and a network of attorneys who are waiting to help you make your debt a thing of the past. Don’t live under the shadow of your debt a second longer than you need to. Reach out to learn more about clearing private and government-backed student loans for pennies on the dollar. Fill out the form below or call 800-500-0908 and one of our support experts will be happy to help.